From June to October, I find Ectemnius digger wasps in the garden. They are formidable hoverfly hunters and, close up, they look so fierce: all enormous, forward facing eyes and long, sharp jaws. 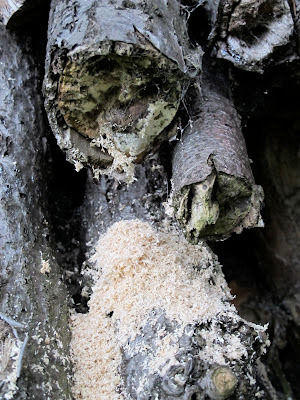 Females bore nests in soft, dead wood using their jaws: a central burrow with lateral cells which they stock with flies. They will lay eggs on the flies and leave their nests for their larvae to feed on the flies when they hatch. They use dead branches on trees, laying wood and even visit bee hotels. Males are often found inspecting holes in dead wood, in search of emerging females. 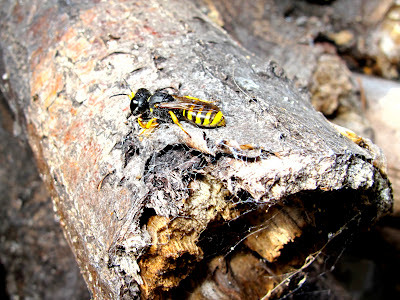 Year after year, these wasps come back to my log pile under the barbecue. 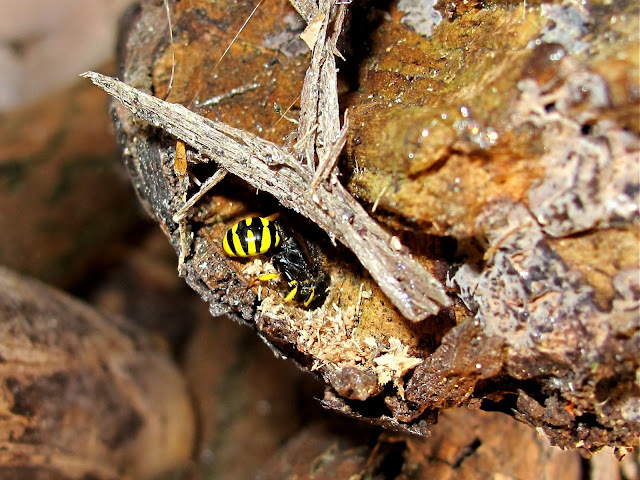 A few days back, I watched a female searching for suitable nest sites amongst the logs. She settled at the end of a lime log and started chewing the wood, producing abundant sawdust in the process (top photo). She carried on for a while, although at the end I think she settled for a different log, as today a large pile of sawdust had accumulated underneath (below). For more posts on Ectemnius digger wasps click here. More great observations in the your ongoing study of the digger wasps! Their jaws are the right tools for woodwork. they are very attractive wee things. I'd love to see some of the hunting behaviour. Must keep my eves open! Thank you Rob and conall. The amount of sawdust is indeed astounding coming from the woodwork of this little wasp, but ID of carpenter confirmed by the presence of a dropped dead Episyrphus on top of the sawdust mound. Cool shots conall, it looks they might be the same species. I haven't been able to id it to sp, but sexcinctus is a good candidate. Your Blog is always a pleasure!